Off-pavement bicycling advocate Bob Horowitz interviewed in August 2016 about the pilot program. The Sacramento County Recreation and Parks Commission has given its final approval for implementation of the off-paved path cycling pilot in the Woodlake and Cal Expo areas of the American River Parkway near downtown Sacramento. The 3-year pilot program will open existing unpaved maintenance roads to people on bikes beginning in September. 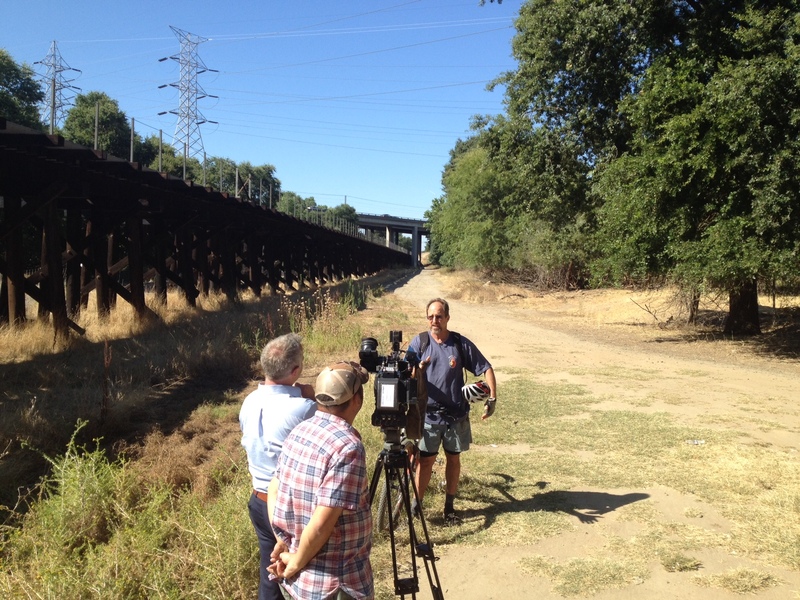 The June 22 vote concludes a 15-year effort led by Bob Horowitz of the Folsom Auburn Trail Riders Action Coalition or FATRAC to accommodate off-pavement bicycling within the American River Parkway master plan. The pilot program has been part of the Parkway plan for the past decade. The County seemed especially persuaded to implement it by the potential for giving kids from nearby neighborhoods more places to ride. Off-pavement cyclists of all ages represent a large new group of potential Parkway stewards and supporters. Off-pavement riding is already permitted in the Parkway east of Hazel Ave., which is administered by California State Parks. The pilot program does not authorize bikes on existing equestrian paths, except in one short segment to be shared. Bicycling on all other equestrian paths in the Parkway west of Hazel Ave. remains prohibited. The implementation plan approved by the commission includes measures for monitoring environmental and other impacts over the next three years, including damage to vegetation at the edges of the trails, whether informal trails or technical features such as jumps or berms are illegally constructed, trash such as water bottles and wrappers, and security as well as conflicts among trail users. By introducing more active uses in this part of the Parkway, the pilot program will begin to help discourage illegal camping and reverse the related impacts of drug activity, trash, human waste, off-leash dogs and wildfires. These benefits also make the Parkway safer for those who bike, walk and run along the paved Jedediah Smith Memorial Trail. Especially in light of the recent violent confrontations in this part of the Parkway, safety remains a significant concern for everyone. Ensuring the safety of new and existing trail users will require additional County funding for ranger patrols. The implementation plan includes funding for added security as well as signs and trash containers. The Sacramento County Board of Supervisors will also be asked to allocate more funding to rangers and enforcement activities throughout the entire Parkway. Potential conflicts with equestrians have also been central to the discussion of implementing the pilot program. While equestrians very rarely use this part of the Parkway, the County will measure the success of the pilot program in part by whether there are fewer bicyclists riding illegally on the equestrian trails. Continued or increased bicycling on the equestrian trails is likely to keep the County from opening more areas of the Parkway to off-pavement bicycling. As the County rolls out the program, watch for more information from SABA and FATRAC about rules for trail users and other details, including the exact opening date. This entry was posted in Blog on June 23, 2017 by SABA.